These two things were said after I had performed at Halifax Central Library on March 13th 2013 as part of the Calderdale Cool List celebrations and I think they are generous, kind and really nice to hear! One of the teachers at Carlton Central Junior School in Nottingham sent me this message. K Mallon commented on Aliens in Schools!! (oh yes)!!!!!!!!!!!!!! Thank you so much for visiting Carlton Central Junior School, it was an absolutely fantastic day, not only were the children energised to go on and read and write more poetry but a lot of teachers were re-energised to teach it. Just a line to say how much the children and I enjoyed working with you on Thursday, up here in Newcastle. It was a a really good workshop, inspirational – and fun! The children were keen to read their stories to the class when we got back, and everyone was impressed with the stories as well as the children’s pride and confidence in what they’d written! So a big thank you, once again. Thought you might like to read this from Nick (governor who you met) – it sums up our feelings about the fabulous workshops you did for us. The children were so enthused , the quality of writing was brilliant for the rest of the poetry focus time. Y4,5, and 6 all performed their poems for parents in class assemblies and poems are displayed all around school. Poetry Event at Meersbrook Bank School . A visit by David Harmer on the 9th and 11th January. This was what was exactly what I saw happening at Meersbrook Bank when I visited last week. 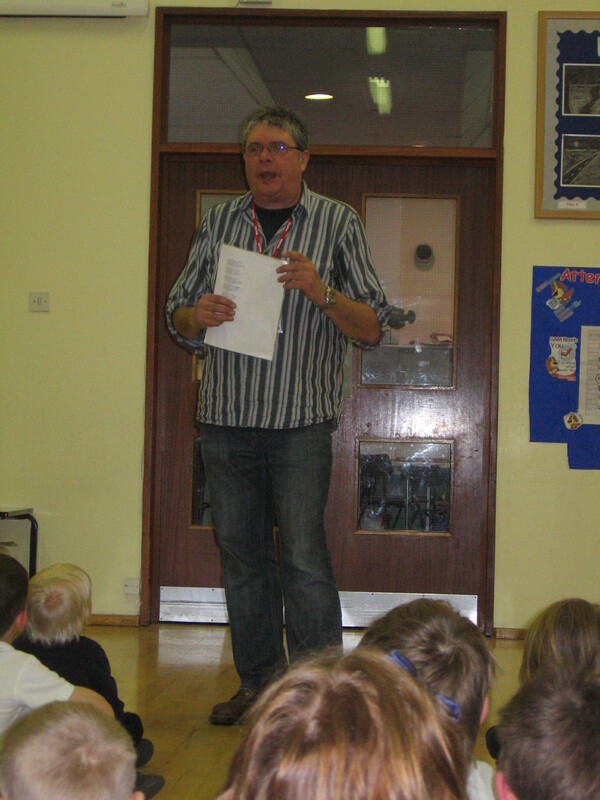 Poet David Harmer began his session with the whole school first thing Monday morning by ostentatiously yawning, stretching his arms and saying ‘Isn’t it early?’ Within minutes he had woken the whole school up and had everybody, staff and children included, rolling about in the aisles. He moved easily from relaxed question and answer with the children to performances of poems which the children joined in. He had the whole school chanting the chorus of a poem about his old head teacher. He used props including a hook and a parrot to help volunteers perform a pirate poem and a poem about the battle between superheroes, Batman, Stinkman and Gelgirl was beautifully enacted by another group of volunteers. Apart from being very entertaining what was impressive was the way the presentation moved seamlessly from conversation to rehearsed readings of poems without the children noticing what had happened. They just suddenly found themselves listening to poems and joining in with them and enjoyed the whole thing immensely. Michael Rosen please note: job done. I then had the privilege of sitting in on two sessions with David later that morning. The first was with year 1 where the class were helped to make up their own group poems about burgers and monsters. The class was fully engaged and it was wonderful to see the class teacher and teaching assistants joining in. The other class was year 6 who worked on a complex choral reading of another group composition. It was fascinating to see David working with two very different age groups drawing in the year 1’s with simple but still challenging structures and giving the year 6 more complex and demanding tasks. (I shouldn’t have been surprised he was a primary head for years.) When we entered the year 6 classroom, after break, a boy was already standing in front of the class reading a poem of his own to an enthusiastic reception and at the end several other students read poems they had written earlier. The class obviously already enjoyed poetry so of course they entered the activities introduced by David with complete commitment mixed with bursts of hilarity. It was great to see them working so well together juggling with different ways of saying things, playing creatively with language and learning so effectively. I was also able to attend the final afternoon gathering on the Thursday where the whole school gathered again to read out the poems they had been working on with David. As I walked up the stairs to the hall two year 5 girls stopped me. One said, “Hello. Are you a poet?” That’s a measure of the impact David had had on them. They obviously now thought any unidentified man walking round the school was most likely to be a poet. In the assembly every student in the classes that David had visited performed a poem or part of a poem. It was a great celebration of the work that had been done and of the fun they had had. Obviously the work begun this week will be continued and developed in class. Many children bought copies of David’s poems and of anthologies edited by him. I thoroughly enjoyed coming in and seeing the children working. In my opinion this kind of enrichment activity and the follow-up work that will be done are invaluable tools for helping the school to achieve its target of improving writing throughout the school. Good writing involves being inventive, trying out different words and phrases, engaging the reader and thinking about how words look and sound. It is also widely accepted that creative, open-ended tasks such those introduced by David last week are particularly stimulating for children who are gifted and talented, as they enable the students to take the task in whatever direction they wish and be really innovative. This was something I saw happening in the year 6 class I attended. For this reason I think the event fits in well with the school’s goal of addressing the needs of its most gifted students. The children were encouraged to play with words and were challenged, at their various levels, to be inventive and experimental with language. They learnt that poems are not just ‘words on paper’ but can be brought to life by the spoken word and turned into exciting, dramatic performances. They were introduced to, or had reinforced, technical terms they will need to know such as ‘rhythm’, ‘rhyme’, ‘ alliteration’, ‘simile’ in a practical context where the meaning was clear. This was particularly evident in the older groups. The choral speaking meant that students worked together and shared ownership of their work and that less confident students were supported by the group. It gave their work a real celebratory feel. Congratulations to the school for organising this exciting event and thanks to David Harmer for his enthusiasm and hard work. I hope we can get him in again sometime soon.